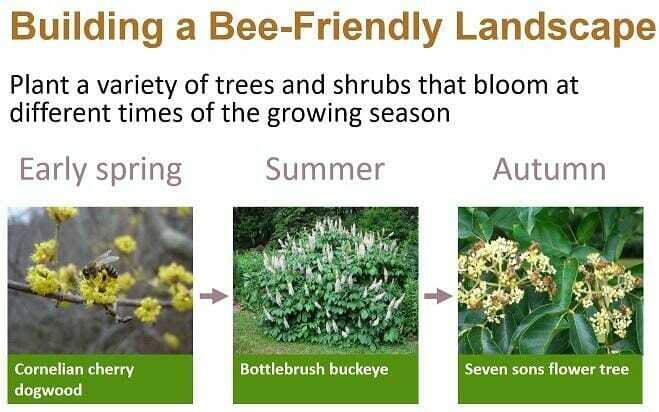 One slide from the Plant Management Network’s open access slideshow on building a bee-friendly landscape. St. Paul, MN, April 8, 2019 – Bees are critical members of the ecosystem: 75% of leading food crops have some level of dependency on pollinators. However, native bee populations are struggling because of loss of habitat and food, often caused by urban and suburban development. 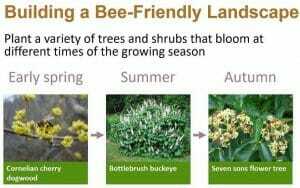 The good news is that a single tree or shrub can produce thousands of flowers with high-quality pollen and nectar, providing bees with the protein and carbohydrates they need to thrive.